Mathilde Redmatn is the deputy director of the Red Cross in the Gaza Strip. Redmatn has had the opportunity to see with her eyes what most of us only see on television screens. On previous assignments, Redmatn has lived in Congo and Colombia. Her activities in Gaza are completely different, she says. "Of course the work is different everywhere, but here the fabric of life is problematic," she says. "There are two peoples, one living under closure and one living under daily rocket fire, which violates international law. 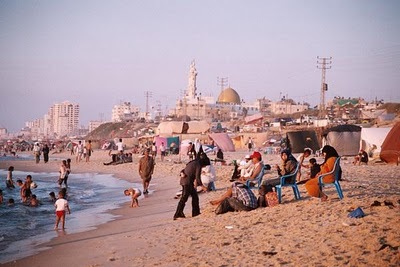 Redmatn has a lot to say about problems related to the closure Israel has placed on Gaza but she also talks about the surprising normalcy in one of the most explosive regions of the world that receives extensive media attention. "There is no humanitarian crisis in Gaza," she explains. "If you go to the supermarket, there are products. There are restaurants and a nice beach. The problem is mainly in maintenance of infrastructure and in access to goods, concrete for example. But above all, it is important to remember that the Israeli army has the right to protect the civilian population in its country. Israel is hurt on a daily basis by violations of international law by Hamas." The Red Cross is an international organization founded in 1863. It promotes laws that protect the victims of war and provides humanitarian aid to people living in conflict zones. Red Cross representatives have worked in Gaza since 1967. Their goal, says Redmatn, is twofold. "We are documenting human rights violations according to international law and we speak with relevant parties on how to take care of the issue," Redmatn says. "We are talking about captives , soldiers, the wounded, and in fact anyone defined by the Geneva Convention. Additionally, in the area of humanitarian assistance, we are mainly engaged in the areas of water and sanitation. We are talking about a highly dense population. Most of the infrastructure cannot be improved due to the closure so we try to improve the situation with existing tools. One example of this is a factory we helped establish in order to clean sewage water that spills into the sea." It is important to remember that the Red Cross is not a political organization by definition. It operates through reports and two-sided dialogue, without expressing its own positions, maintaining complete neutrality. "Our goal is not to negotiate peace, but to ensure the well-being of the civilian population," Redmatn says. "We understand and recognize Israel's right to security but it needs to maintain the balance between that and the right of Palestinians living in Gaza to a living and to proper medical care. Of course this is also the responsibility of Hamas to its citizens and therefore we also have relations with them." The Red Cross played a role in the Gaza flotilla incident last year. "We offered our assistance to Israeli authorities in regards to people who were arrested who were from countries without diplomatic relations with Israel," Redmatn says. On the question of whether the flotilla was peaceful, she answers neutrally "this is a matter we discuss with the responsible parties." According to her, the flotilla led to changes in Israeli policy on Gaza but those changes are not yet complete. "More goods enter, but there is still room for improvement" in regards to exports and the passage of people, she says. A clear goal, but is it possible in light of the current threat? The subject, Redmatn says, is sensitive. "Rocket fire from the Gaza Strip is against international law because it is directed at civilians," she says. "We conduct hidden dialogue with Hamas on the matter. As time passes, the dialogue also develops." On recent events in the Arab world, Redmatn says: "The new wind blowing in the Arab world doesn’t change the current activities of the Red Cross in the Gaza Strip. It's still too early to tell what will happen and how needs will change. In any case, we will respond quickly to changes and we will see what the future holds." "We will continue to ask to monitor Gilad Shalit but we do not have the capability to force anything on Hamas"
Operating in the Gaza Strip requires the Red Cross to work on an ongoing basis with the IDF. "The relationship with the IDF has developed over the years," Redmatn says. "The army understands our mandate. We are in daily contact with each other to coordinate the entry of goods into Gaza and the entry and exit of people, sometimes our personnel and sometimes patients who are going to Israel to receive medical care. The second matter still needs improvement as the time required to cross the border is still long. We hope to augment the medical equipment in Gaza itself in order to reduce the number of people who need to go outside [of Gaza]." These days, she says, the organization has the goal of strengthening the relationship with IDF soldiers. "Not everyone understands what we are doing," she says. "Therefore, we talk about our work to soldiers who serve at the Erez crossing. The intention is to expand this to the entire area around Gaza." But working with the IDF does not only regard the civilian population living in Gaza; it also touches on captive IDF soldier Gilad Shalit. Repeated requests by the Red Cross to monitor Shalit's condition have so far been met with persistent refusal by Hamas. "When a person's freedom is taken away, he deserves at least contact with his family," Redmatn says. "We will continue to ask but we do not have the capability to force anything on Hamas. Hamas' refusal is based on security reasons. Hamas is afraid of the IDF's advanced technological capabilities and believes that allowing contact will lead to the location of Gilad." Redmatn called on all sides to abide by international law. "It is important that organizations and countries respect international law," she said. "Only thus will the situation get better."